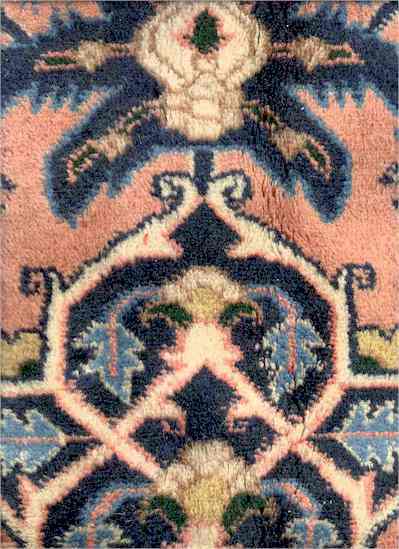 The Antique Serapi Heriz Rug is one of the most sought after rugs particularly in the USA and England for many years. 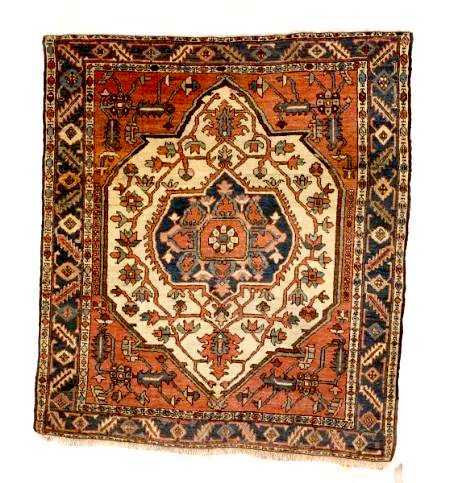 Antique Serapi rugs are a major draw particularly in big city America, No other rug so epitomizes the "East Coast Establishment" than the Antique Serapi Heriz carpet. The term Seapi however is an amazingly emotional and evocative term for rug collectors. 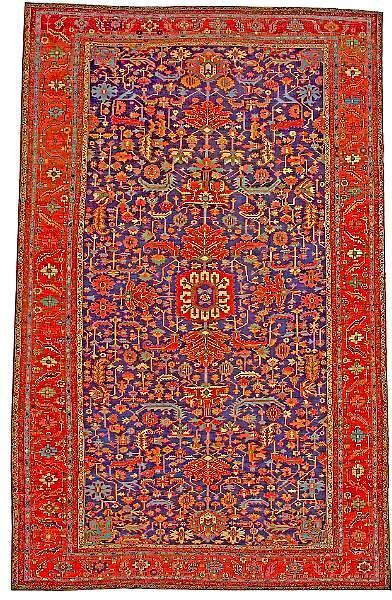 Some people call them Seapi rugs and others call them Antique Heriz Rugs. The intensity of feeling is similar to that reserved for politics and sports rivalry. The line between a Serapi and an antique Heriz is more a matter of style than substance. For instance Sotheby's New York does not generally use the term Serapi while their counterparts at Sotheby's London regularly use the term. In Germany both Nagel and Rippon Boswell use the term Serapi. Sarab was both a town and a Khanate. Khanate is an old fashion term for an administrative district or state. The use of i on the end indicates that it is from Sarab so simply put Sarabi means from Sarab. 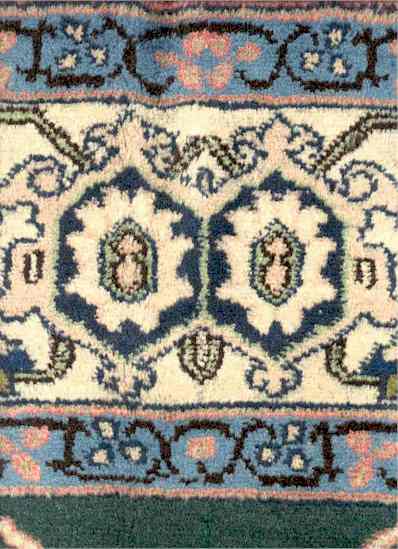 All the rugs and carpets from the Heriz area would have been known as Sarab under the old name of the area. The carpets known in the trade as Serapi are clearly from the old Sarab Khanate. 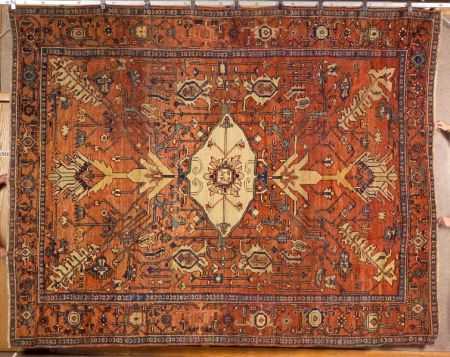 How then did Sarabi carpets become known as Serapi? I suggest that about the time the west was coming to know the carpets of Sarab a major news and gossip item was the Prince of Wales 1876 trip to India on the H.M.S. Serapis. Similar words and I suggest that Serapis became the popular pronunciation since it was the more familiar sound. 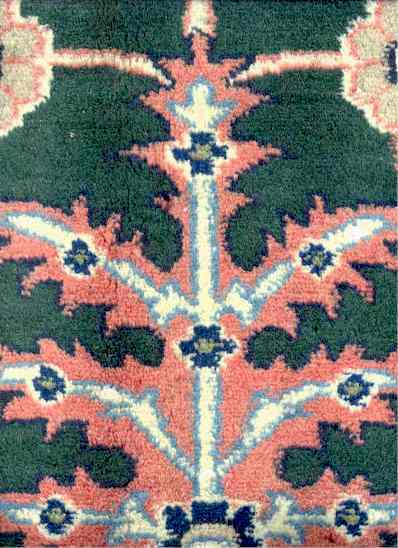 Cecil Edwards made the point that Serapi rugs are from Sarab. 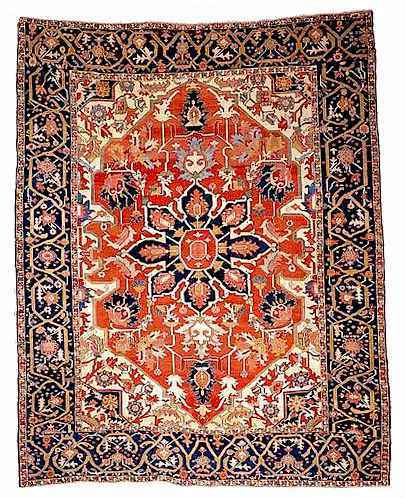 In the United States the highest quality of Antique Heriz Carpets are called Serapi. Quality is higher than the average and knot counts are around 80 knots per square inch with the very best going up to 100 knots per square inch. 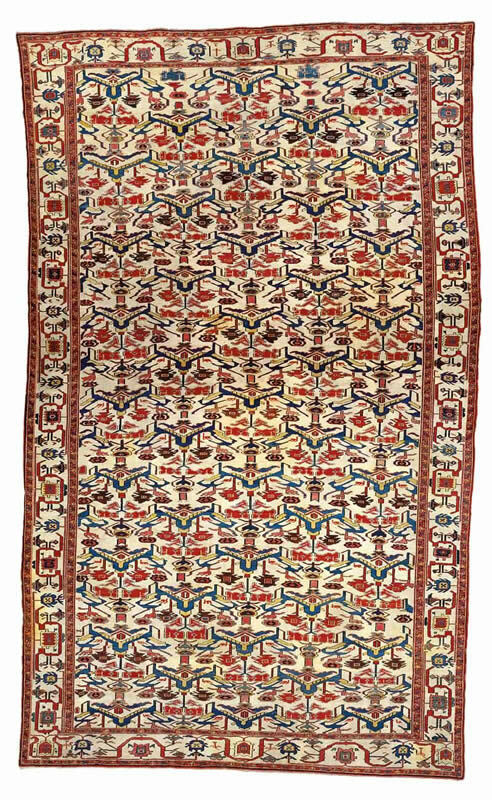 Serapi rugs fall into two separate styles. The all over design is fairly busy but the other group is the medallion style. 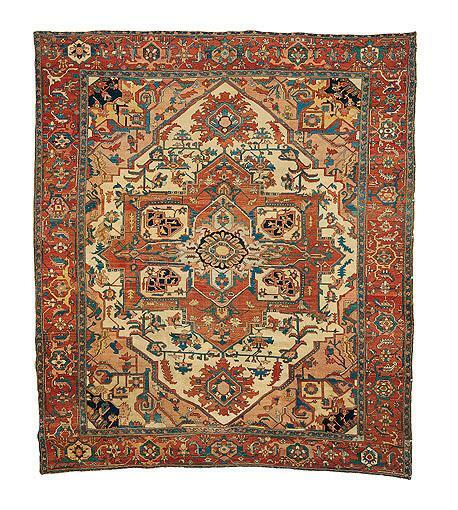 The medallion rugs are far less busy than later Heriz rugs. Both groups have the mellow jewel tones of antique natural dyed rugs. Structure: Depressed symmetrical knot pulled right. Knot counts can range from 25 to 100. 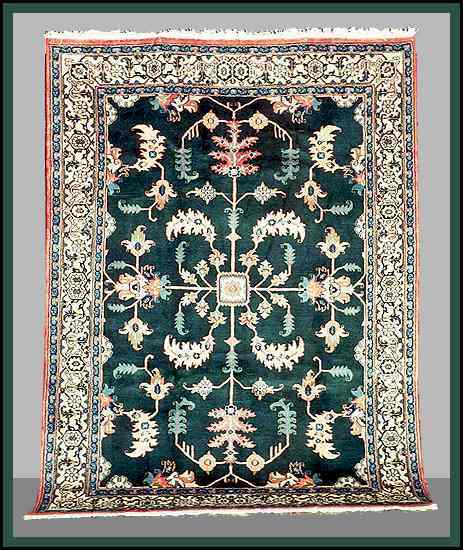 Often newcomers to Oriental Rugs assume that finer means better. With Serapi rugs this is not at all the case. Anything over 100 knots per square inch looks wrong. 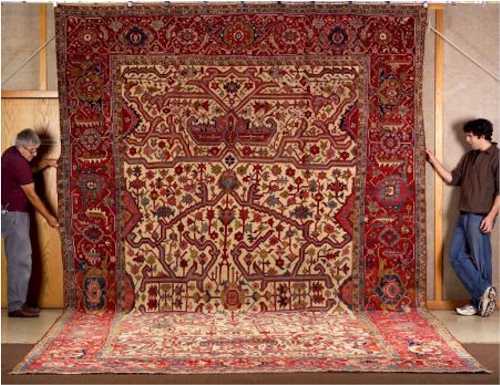 Antique Serapi Carpet last quarter 19th C.
Rewoven ends, other small repairs. 11 ft. x 8 ft. 9 in. 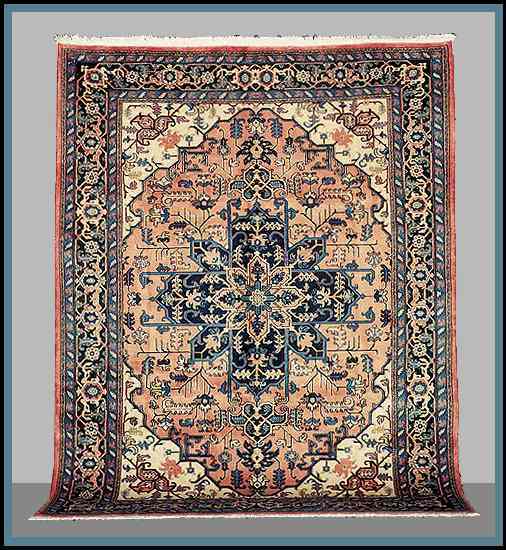 Antique Serapi carpet late 19th C.
Slight even wear, guard stripe rewoven on one end. 18 ft. 6 in. x 11 ft. 2 in. 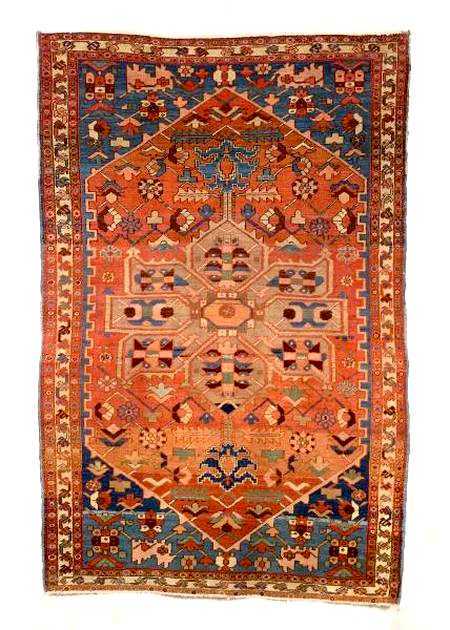 Antique Serapi Rug last quarter 19th C.
Slight even wear to center, minor end fraying, small repair. 7 ft. x 4 ft. 8 in. Guard stripes partially missing from both ends. 5 ft. 7 in. x 4 ft. 11 in. Size: 7 foot 7 inch by 10 foot 1 inch. 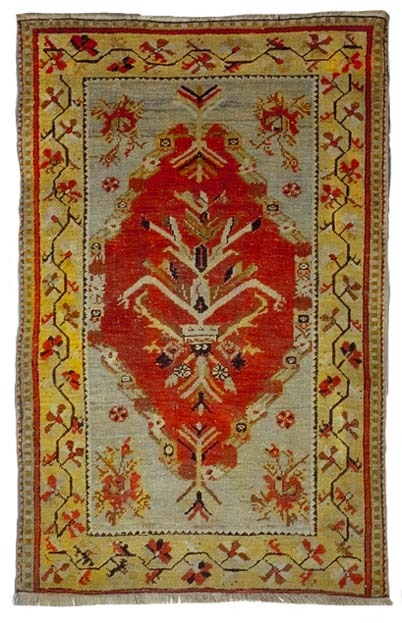 This is an extremely high quality Heriz carpet from Serab in the Heriz region. The wool is excellent and hard-wearing. The colors are in the tones demanded by today's most discerning buyers and decorators. This rug is without flaw and in "as new" condition. With a knot count of 100 knots per square inch this an exceptional quality Serapi Heriz carpet. It is hand-woven and is 20 to 30 years old. Heriz Region, Iran, 20th century. Colors: Salmon, old gold, peach, navy blue, Columbia blue, vanilla, copper. Warp: 3 ply ivory cotton. Weft: 2 shots lavender cotton. Selvages: 5 cord overcastting peach wool. Handle: Heavy, soft wool, durable, dense. 412 by 353 cm., 13ft. 6in. by 11ft. 7in. Approx. 565 x 343 cm. Some footwear; rewoven and restored in several areas, partly stained. Size: 6 foot 4 inch by 8 foot 5 inch. 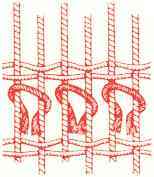 Structure: Symmetrical knot pulled to the right. 8 knots per horizontal inch and 10 knots per vertical inch. 80 per square inch (1240 per square decimeter). Colors: Hunter green, vanilla, sky blue, navy blue, midnight blue, sea foam green, olive green, salmon, brown, light salmon. Warp: 3 ply white cotton. Selvages: 4 cord overcastting salmon wool. Handle: Heavy, durable, soft, dense.